This weekend was the best competition so far. It was also the first lead competition of the 2017 season. So it is easily to be deemed the best competition so far. But I guess it will stay the best competition for a while longer. It started Friday morning at 8:30 in Kontich. I was in a bad mood. I was unhappy, grumpy and very hungry. I think that my family was getting a bit too much of everyone and we all needed a break. But I still gave my mom a hug when it was time to go and kind of waved at the rest. My dad took me to Kontich and on the way he talked to me and I started feeling part of the family again. We arrived at the carpool parking and there was the team. Without them knowing, they cheered me up. I was almost back to normal. Waiting for the minibus to arrive didn’t take long and soon we were all loading the bags in the back of the minibus. I walked over to my dad to give him a hug, it’s kind of a tradition, but it’s also cause I need it. The drive to Imst was long and took a whole day. We arrived somewhere between 6-7 pm. Although we had been sitting down the whole ride, we were exhausted. And soon the whole team sat together at the dinner table. I slept together with Héloïse in a room. The next morning, I forgot all about my sadness of the day before and was concentrating on not waking up my roommate as I walked around our room, getting dressed and using the bathroom. Breakfast was good and I ate until I wasn’t hungry anymore. I also prepared a small sandwich to take with me. The ride to the gym was mostly silent as everyone was a bit nervous and too early to say much more. 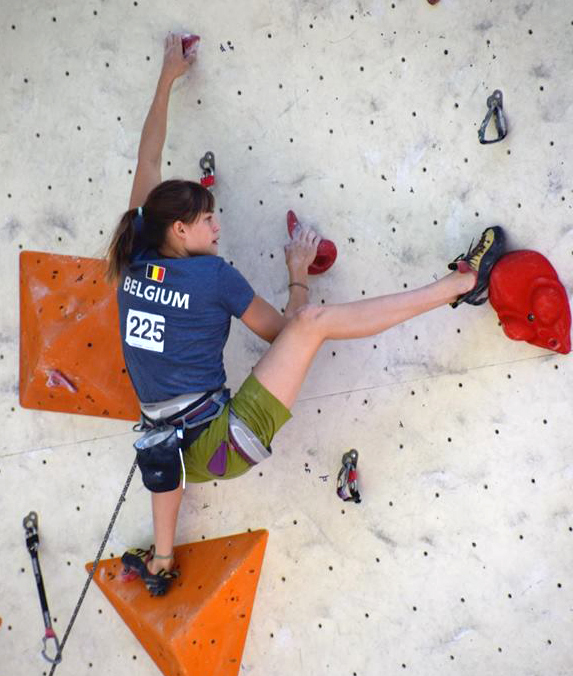 Imst is a very big gym and I had little time to study the route and help read another Belgian girl. My first route looked pretty cool. I had a blue route with big round holds. It also didn’t look that hard but it sure was pumpy. I warmed up and then I climbed. I didn’t have any stress and that was the best feeling ever. I fell because I was tired and there was no pressure on me. While climbing, I stayed calm and I climbed relaxed and didn’t hurry it. After the selections, we went to the hotel and there we rested and played some games in our room. We also ate and then I took the second shift to the venue. The second selection was a red one. I read it and then waited and then I started warming up. This time I was ready earlier. When it was finally my turn, the sun was already creeping up the floor on which the wall was built. And everyone had to move with the shade. In the first route, my fingers were cold and in the second route I was sweating. So the contrast was enormous. In the second route I think I climbed less good than in the first route. But I still made it. I got 10th place after the selections and that meant that I could go in isolation the next day. The next day, I woke up early for the second time. This time together with Heloïse, we went to eat breakfast and with all our bags already packed, we went to the car. The drive to the isolation was silent as usual at this time of the day. Four Belgians managed to reach the finals. 1 boy Sven, also a junior and 3 girls, Lucy, who is in the B category and Héloïse and me, both second and last year juniors. When it was finally time to start reading the route, we walked down in one big group and started reading. The beginning looked easy and then, in the overhang, it became harder as you had to turn around with your feet. Climbing back up the mountain, we had left Lucy behind because she had to climb 3rd. I had to wait in the gym a little bit more and then I could start warming up. Finally all the waiting was done and I climbed together with Sven in the Imst car that drove us down the mountain and behind the wall. There, I went to the bathroom and then I was soon sitting on a chair behind the wall tying my shoes. I drank some water and then offered Sven some. We were going to climb together and we were both very focused. I started climbing and while reading, I hadn’t felt the first hold, so when I finally touched it, I was shocked to find that the hold was so good. It was a big jug. I climbed the first part easily and when I came to one point were the holds became less good, I had to tell myself to concentrate and that was it. In the roof, I did the turn easily and then I climbed some more and I told myself that everybody was going to pass the turn, so I climbed higher. I was pumped and I couldn’t hold the small crimp anymore and giving one final try, I fell. I don’t know if I was happy. But I think that I was a little content. As I saw more climbers climb and fall under me. I became very shocked and surprised and each time I gained a place. Until Héloïse climbed and she got a few holds higher than me, making her 1st and when the two girls from Switzerland fell under me, it was obvious that I had become second. On the podium, I felt a bit shy. We got a trophy and the prize for the second place was a rope bag. After the podium, I called my dad to told him the good news, obviously he already knew. But he was very happy and after hours of driving home, I got to give him a big hug.